For other uses, see Goolwa. Goolwa is a historic river port on the Murray River near the Murray Mouth in South Australia, and joined by a bridge to Hindmarsh Island. The name "Goolwa" means "elbow" in Ngarrindjeri, the local Aboriginal language, and the area was known as "The Elbow" to the early settlers. 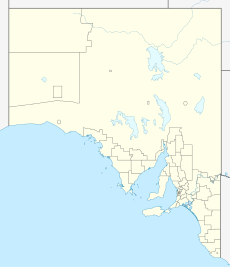 Goolwa is approximately 100 km south of Adelaide, and is the seat of the Alexandrina Council. It is in the state electoral district of Hammond and the federal Division of Mayo. At the 2011 census, the state suburb of Goolwa (excluding Goolwa Beach, Goolwa North and Goolwa South) had a population of 2201. The ABS no longer publishes separate urban population estimates for Goolwa alone. At June 2015 the estimated urban population for Goolwa together with nearby Victor Harbor was 25,877. Before 1837 the area was briefly considered for the site of the colony's capital; a 'special survey' was undertaken in 1839–40 with a sizeable township laid out at Currency Creek and land for a port with substantial warehousing on the river where Goolwa now stands; however, the treacherous waters of the Murray Mouth for shipping made it unsuitable as a major port. Goolwa was Australia's first inland port (1853) built to connect Goolwa to Port Elliot and later extended to Victor Harbor, allowing goods to move from river boats to sea boats, so that neither had to negotiate the Murray Mouth. The spread of railways to inland Australia put an end to the river trade and Goolwa's importance as a port. With the decline of the river trade Goolwa became dependent on local farming and fishing, as well as becoming a popular destination for holidaymakers from Adelaide. In 1935 a permanent barrage (called the Goolwa Barrage) was constructed between Hindmarsh Island and Sir Richard Peninsula on the south eastern outskirts of Goolwa. The barrage separates the fresh water of the River Murray from the salt water coming up from the River Murray mouth. The barrage was constructed to prevent the salt water traversing further up the River Murray and polluting much needed fresh water. Goolwa had earlier been connected to Hindmarsh Island by a cable ferry; this was replaced in 2001 by the official opening of the Hindmarsh Island bridge, the construction of which had been a focus of national controversy during the 1990s. During 2008 and 2009 Goolwa suffered from one of the worst droughts in Australian history and the river which has sustained the town throughout its history was reduced to nothing much more than a channel and mudflats. The crisis prompted ongoing discussions with state and federal governments with the aim of releasing more water from upstream to ensure the survival of the river. In 2009 a temporary levee (called the Clayton Regulator) was constructed between Clayton Bay and the north east side of Hindmarsh Island. The Regulator was put in place to protect the Goolwa Channel and its tributaries from the danger of acid sulfate soils. The low water level was exposing the river bed and scientific evidence warned of the devastating impact of acidification of the Lower Lakes region. The Regulator immediately increased the water level between the Regulator and the Goolwa Barrage. In 2010 increased rainfall and water from upstream allowed the Regulator at Clayton Bay to be substantially removed. The rainfall has replenished much of the river and lower lakes. In late 2010 some gates on the Goolwa Barrage were opened for the first time in many years to allow fresh water to flow to the Murray Mouth. Continued rainfalls combined with flooding upstream in NSW and Victoria has led to massive flows down the River Murray and by January 2011 all the gates on the Goolwa Barrage were open. Every odd-numbered year, Goolwa hosts the South Australian Wooden Boat Festival. The town is a popular holiday destination and home to the PS Oscar W, a paddle steamer. Goolwa, along with the neighbouring towns of Middleton and Port Elliot and the city of Victor Harbor have in the 2000s enjoyed a nationally recognised "sea change" boom, with people moving there from more metropolitan areas for an improved lifestyle on the coast. The local councils are left with the dilemma of how to provide sufficient services for the influx of new residents, while at the same time not spoiling the character and appeal of the area that attracts newcomers. In March 2007, Goolwa was declared a Cittaslow by visiting Cittaslow representatives. Goolwa was the first non-European town to gain Cittaslow status. On 22 January 2010 the 4th stage of the Tour Down Under finished at Goolwa. As part of the event more than 8,000 cyclists, that participated in the preceding Mutual Community Challenge Tour, rode into Goolwa on the day. ^ Australian Bureau of Statistics (27 June 2017). "Goolwa (State Suburb)". 2016 Census QuickStats. Retrieved 20 April 2018. ^ a b "Search result for "Goolwa (Locality Bounded)" (Record no SA0002912) with the following layers selected - "Suburbs and Localities"". Property Location Browser. Government of South Australia. Retrieved 23 May 2016. ^ "Fleurieu Kangaroo Island SA Government region" (PDF). The Government of South Australia. Retrieved 17 April 2017. ^ "Federal electoral division of Mayo, boundary gazetted 16 December 2011" (PDF). Australian Electoral Commission. Retrieved 2 August 2015. ^ "Monthly climate statistics: Summary statistics HINDMARSH ISLAND AWS (nearest station)". Commonwealth of Australia , Bureau of Meteorology. Retrieved 29 April 2016. ^ "Goolwa and the South Coast". The Register. Adelaide: National Library of Australia. 30 April 1926. p. 7. Retrieved 6 September 2013. ^ Australian Bureau of Statistics (31 October 2012). "Goolwa". 2011 Census QuickStats. Retrieved 23 May 2016. ^ "South Australian Wooden Boat Festival". SA Woodenboat & Music Festival 2008. Retrieved 13 June 2016. ^ "Goolwa (Hindmarsh Island Marina)". Climate statistics for Australian locations. Bureau of Meteorology. November 2018. Retrieved 12 November 2018.